Home > Computer > What is a USB Pen Drive and Do I Need One? If you work in a busy office environment then the chances are you’ve come across a USB pen drive before. You may also have heard them called ‘USB flash drives’, ‘USB sticks’ or simply ‘memory sticks’. However, if you’re lucky enough not to work in an office, or if the purpose of these little gadgets has slipped your attention, all will soon be explained. You may find that a lot of your day to day computer related tasks would be all the easier with one of these handy little contraptions by your side. 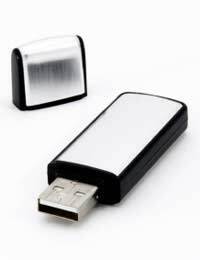 A USB (universal serial bus) pen drive is a small, portable data storage device that can be used just like a floppy disk to save, transport and transfer data between computers. The device itself consists of a small printed circuit board, encased in a plastic, metal or rubber shell. This makes the drive sturdy enough to be conveniently carried about in your pocket, or attached to your keys. They are available in various different designs, some sleek and functional, others fun and kooky, and are reusable, allowing you to delete old data and save new files as much as you like. The advantages of a USB stick over other storage media, such as writeable CD and floppy disks, are huge. In fact the limited storage capacity of floppy disks has rendered them virtually useless these days and although they are still good for small documents, they will struggle to fit on any larger files, such as photos, video, or software. In terms of actual storage size, USB sticks are available in sizes from 64MB all the way up to 64GB, compared to floppy disks rather modest 1.44MB. As well as towering over floppy disks in terms of storage space, USB pen drives also have a much more durable design, are much faster, more compact and much more reliable due to their lack of any moving parts. For example, it can be quite easy for dust to gather inside a floppy disk which may then cause scratching when the inner disk begins to rotate inside your PC. This can damage your saved data and in the worst case scenario, even damage your computer. USB sticks also offer many advantages over CDs, as they are less easy to damage and more convenient to use. Do I Need a USB Pen Drive? Well, if you work in an office where you often need to transfer files between computers or with colleagues, then having an easy means of portable data storage is a must for when files are too big to send over a network or via e-mail. If you own more than one computer at home and want an easy way of sharing files between them, or you have friends with whom you’d like to share photos or videos, then a USB pen drive is a nice and easy way to do so. Unfortunately, floppy disks are becoming less and less common and are slowly being phased out, as fewer and fewer new computers come with floppy disk drives to support them. So if you’re still attached to your little flat friend, I’m afraid you may soon be forced to move on to newer technology. Worried about price? Don’t be. With a little research online, you can find a brand new 1GB model for just a few pounds and with a little extra money you can afford to shop around and find a design that really suits you. Find the right one and you’ll wonder how you ever lived without it.